One has to marvel at the workings of Fran and Douglas the creative team behind the company Phoenix Artisan Accoutrements and now Crown King. A perfect union to create some of the most interesting shaving products around. Who would have guessed that shaving could be so much fun! Today we look at one of PAA’s products but not for its flashy packaging or product storyline but rather just for its performance and scent. This one is called Solstice. I had asked Douglas if he wanted to participate in our Wet The Face giveaway for January of 2018 and without hesitation, he agreed. He thought about it a bit and then said he was going to send me Solstice. The soap comes in a clear plastic 4oz tub with a white screw on lid which is extremely wide for loading your brush with. The label has an Arizonåa flavor to it with the word SOLSTICE in big bold letters along with the company name right on top. Included are side labels so if you do stack your soaps you won't have to fumble through to identify all of them. I personally have found this feature to be a real time saver. I have to say the scent is amazing. A profile of ﻿Sage, Sweetgrass, Cedar, Rose Absolute and Benzoin Resin pays homage to the traditional herbs and resins used by ancient healers and mystics around the Sedona Verde Valley region in Arizona, where the artwork for the label takes its inspiration. I bowl lather and Solstice did not disappoint. I was able to create so much lather that the brush nearly disappeared. The great slickness, glide, and the cushion was allowing me to go over trouble spots without fear of irritation. My post shave feel was a good one as well a very close shave was had and if I owned the matching aftershave I would have applied it to keep the scent going on throughout the day. So, I had a great experience with Solstice and would highly recommend it. 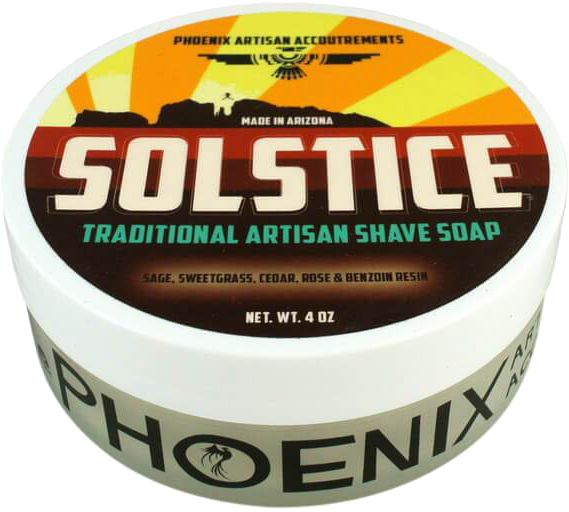 When I first received this soap the surprise for me was when Douglas told me he was going to send the winner his own Solstice shaving soap and the one that I had was mine. How amazing was that!